Next week is Comic-Con. That means over a hundred thousand committed pop-culture junkies – Guttersnipe included – will make the pilgrimage to San Diego to overdose on all things geek. Comic-Con has been called Nerd Prom, and if that’s the case, Vancouver very well may be home to its Prom Queen. Vancouver’s own Camilla d’Errico isn’t what you’d call a nerd (at all), but she is a perfect spokesperson for all the great creativity found amidst the Hollywood pandering that often overshadows the show. D’Errico has quickly become an artist to watch out for not just her talent, but also her versatility. With one foot planted in the comics scene, and the other in the pop-art gallery scene, her manga-influenced art has not only graced t-shirts, purses and pillows, but online games, coloring books, and, recently, vinyl toys. She even has a growing army of cosplayers, dressing up as Helmetgirls – based on her patented creepy-cute series of paintings. On the verge of Comic-Con, her studio, right in the heart of downtown, must look something like Santa’s workshop the day before Christmas. She’s produced two pieces for the Comic Book Legal Defense Fund, a cover and page for Color Ink Book’s colouring book, an alternate DVD cover for a documentary about comics writer Grant Morrison, and designs for a line of vinyl toys. 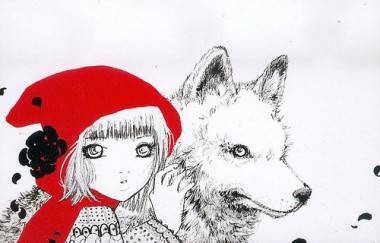 If the convention won’t be busy enough for her, she’s also got to make time for the Eisners – the big comics industry award show – where she’s nominated for a Red Riding Hood story she worked on with writer Bryan Talbot. Tanpopo vinyl toys designed by Camilla d’Errico. Somehow amidst the four or five projects she’s currently working on, she found time to answer some questions. Ryan Ingram: Alright, since we’re doing this interview by email, how do I know you’re actually real? The amount of art you produce seems inhuman. Have you cloned yourself? Do you have an army of ultra-artistic elves at your disposal? What’s your secret? It’s robots, right? You know, I’ve actually had to tone down the amount of work I do over the past couple of years because I was out of control. I love producing art and I get into it so much that it literally takes over my life. There are so many things that I’d like to do – paint, draw comics, create characters, make toys, do commercial work, except I can’t always do it all at the same time (incredible but true). RI: You’ve begun the process of turning your series of Helmetgirls paintings into comics with writer Joshua Dysart. The two of you also first worked together on an Avril Lavigne comic together. Now that you’re creating your own empire, and Avril’s resorted to shilling cameras, has she begged you guys to make any more comics for her? CD: Well, I suppose I could consider her for the soundtrack… kidding!! I’m having an awesome time with the Helmetgirls project; we’re doing the concepts for it now, getting a publisher on board, and very likely putting it on Kickstarter to get some support. As you may know the comics and publishing industries are being hit pretty hard so we’re falling back on our own resources more and more. But I will stop at nothing to get Helmetgirls printed and into people’s hands. Heck, there are even cosplayers of Helmetgirls (I’m having a big Cosplay competition in August in Vancouver at Cos & Effect). As for Avril, I think we’ve both moved on. She changed her look and style (though I like the sexier, more mature look) and I’m really into drawing my own characters and stories. It was a fun project! RI: The Helmetgirls website features a ton of interesting-looking characters. Each Helmetgirl seems like she could have her own unique action figure. Can you tell us about the Helmetgirl mythology and their world? What kinds of stories will the comics will be exploring? CD: Well, I have to start by saying that the Helmetgirls that will be in the book won’t be related in any way to the paintings. The paintings are extremely fantastical; their headgear is improbable, gargantuan. Those girls are myths; they are beauties frozen in time and space that only the viewer can connect with. The Helmetgirls graphic novel, which will be called “Origins”, is going to be a world unto itself with many characters and a plot that ties the epic adventure together. I’m so stoked about it but I can’t say too much right now. Joshua Dysart has come up with the most beautiful and epic story I could never have imagined for the Helmetgirls. Here’s a bit of a teaser for the books: Helmetgirls is a fantasy allegory for childhood lost, the rise of the industrial state and the role of feminine imagination trapped in an impoverished world. I will be able to talk about it more soon though. 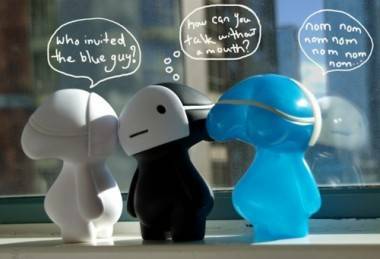 But I certainly hope that the Helmetgirls will get their own figures/toys! RI: You mentioned Helmetgirls cosplayers at conventions now. Is it crazy seeing people dress up like your creations? What’s the most impressive Helmet Girl you’ve seen so far? CD: I honestly can’t say I have a favorite. 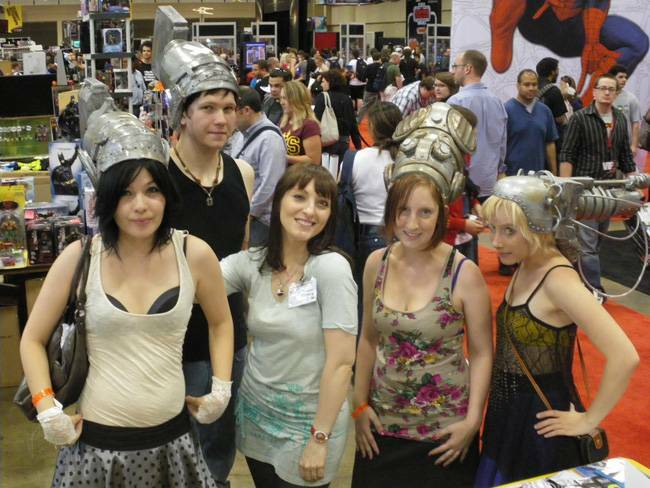 The three original girls that came as Xiomara, Bean and Guilded Cage will forever hold a special place in my heart because when they showed up in costume I realized my destiny, insofar as Helmetgirls was concerned. 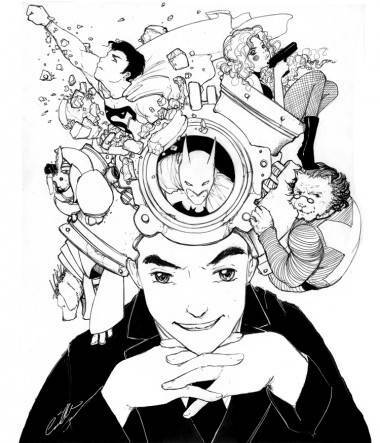 RI: You teased a work-in-progress on your website last week, featuring creations and characters made famous by mad comics genius Grant Morrison – are you allowed to reveal what this is for? Camille d’Errico’s alternate cover to the Grant Morrison DVD Talking With Gods. RI: You’ve been to conventions all over the world, and you’ve been to Comic-Con a bunch of times. What’s your craziest convention story? CD: So I’ll have to give you a PG-rated convention story because as you may well know or imagine, there are lots of parties at Comic-Con, and in my first years when I didn’t have a booth to work for 12 hours a day, I would happily be out all night!! Most conventions are like this – it’s such an awesome environment to be in – the energy is unbelievable. RI: This will be the first time our editor/publisher at The Snipe will be heading to Comic-Con. Do you have any tips or advice for him on how to survive the show? CD: Drink G2. Lots of it. Enjoy the parties, don’t skimp out on the fun. Try to arrive early in the morning if you want to be able to buy the stuff you really want (preview night is even better for that). You’ll need a backpack, as it protects your back and lets you put all the stuff you’re going to buy in there. If you’re on a budget, for real, leave your credit card at home. Otherwise, go nuts because there is so much that will be calling your name. And pack some deodorant in that backpack; it gets hot and sweaty in the halls. If you’re headed to Comic-Con, you can find Camilla – and her mecha-nanobots – at booth # 4723. Not surprisingly, she’ll also be signing at seven different booths. 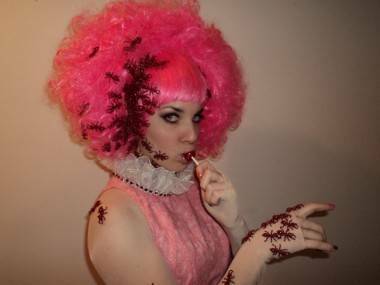 For more info, visit her site: camilladerrico.com. This entry was posted in interviews and tagged Camilla d'Errico, comic books, Vancouver cartoonists. Bookmark the permalink. This is an amazing article. 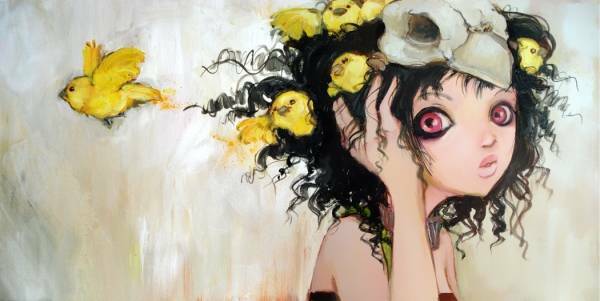 I’m OBSESSED with Camilla D’Errico! She is my inspiration. I like drawing with the same emotions in my drawings as her, usually. I just like the emotional characters so much, that I just HAVE to do that to my own! I am completely loving this article! I am speechless of how great Camilla is. I would LOVE to meet her! When I am old enough, I hope to have a career just as much fun as her’s. Comments like yours keep us going! Thanks Artsy Emily!